1) Use a compass to draw a circle. Keep the compass set at the same position for the next step. 2) Place the compass point on the edge of the circle and make a faint mark on the edge. Then place your compass point on this mark and make a second mark. Continue around the circle until you have made six marks. They should fit perfectly. 3) Now you will use the straight edge to connect different points. Draw your lines as faintly as you can, because you will be erasing some of these lines later. First, connect opposite points to make three lines which all cross at the center of the circle. Each line cuts the circle exactly in half at its widest point and is called the diameter of the circle. 4) Next, connect every other mark to form a large triangle. 5) Connect the other three marks to form a second, upside-down triangle. 6) Mark the six points where the large triangles intersect (cross) the three diameter lines. Then connect every other mark to form a small triangle. 7) Connect the other three marks to form a small upside-down triangle. Now you have drawn all of the lines needed for making all three hexagram designs at the top of this page. You just need to darken the lines needed for one of the three hexagram designs and erase the remaining pencil lines. 8) Use a straight edge and a dark pencil, colored pencil, or pen to trace over just the lines needed for this design (the red lines on each diagram). You may also like to look again at the shapes which form each design at the top of this page. 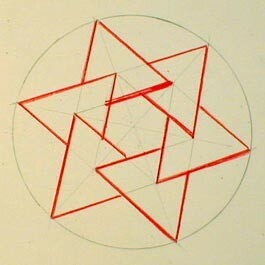 This photo shows the outlines of the six triangles, darkened with straight red lines. Notice how faint the remaining lines are. 9) Erase the faint lines which are not a part of the design. 10) Color your design and cut out the circle. If you like, you can paste each hexagram design onto a backing of posterboard, cardboard, or foamboard and hang it from a loop of yarn or thread. You could paste a different design on the back and hang several to form a mobile. 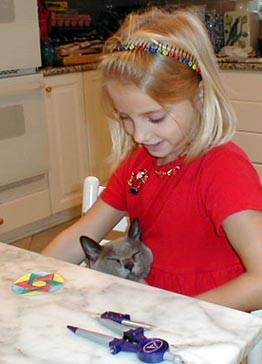 Emily and Fatso are very proud of their hexagram! 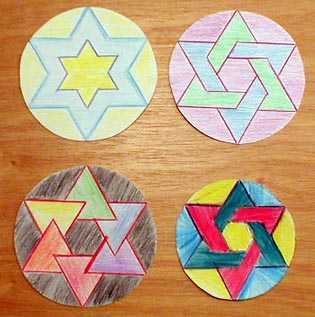 Extra Challenge: Can you think of some other ways to outline and color to make a different kind of hexagram design? For instance, the three hexagrams pictured at the top of this page all have empty centers. Can you create a design which uses some or all of the tiny shapes in the center? 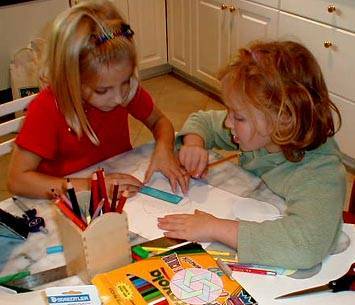 Can you and your friends or classmates each create a unique design? How many lines of symmetry does your design have?